Click here for a coloring book version of this! Vanilla ice cream might sound ... well, plain vanilla. But it's a good test of a new ice cream book. And just because I made unadorned vanilla ice cream doesn't mean I ate it that way. I had plenty of dulce de leche to use up from my recent sous vide experiments. And to be honest, I like vanilla ice cream a lot. If it's made well, and it's rich and creamy, and it was made with good vanilla extract, it can stand on its own, without strong flavor covering the vanilla-ness. 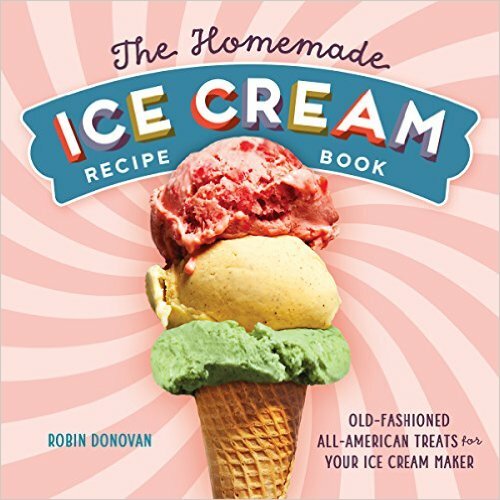 Speaking of books, this recipe was from The Homemade Ice Cream Recipe Book by Robin Donovan. I got it from the publisher and immediately started to browse. The first thing that struck me was that many of the recipe used the same proportion of cream to milk to eggs - two cups of cream to one cup of milk to six eggs. At first, I thought, uh oh, there are going to be a bunch of recipes that are all the same except one will have vanilla extract and another will have mint. But after looking more, that's not the case. That ratio happens to be a very good one for making a rich ice cream, so it makes sense that it's used over and over. The funny thing is that I got another book recently (not an ice cream book) that had an ice cream recipe with the same ratio. Like I said, it makes good ice cream. And it's the right amount to fit into most home ice cream makers, so that's probably the reason it's so common. The first chapter with recipes is called Classics and Standouts, and it's the more common flavors, from vanilla to mint chip to cookies and cream. The next is chocolatey flavors, followed by nutty, fruity, and party flavors, followed by a chapter of sherbets and frozen yogurts. It finishes with a chapter of cones, toppings, and other non-ice cream recipes. I already have a couple of ice cream books, but it's always fun to try new recipes. The brown butter pecan is definitely on my list to try. Meanwhile, I was really happy with this vanilla. It uses a little less sugar than my standard for this amount - I usually use 3/4 cup, while this uses 1/2 cup plus 2 tablespoons. And I was perfectly happy with that level of sweetness, AND the texture of the ice cream. The recipe suggests cooking this mixture in a double boiler. I've done that and I've also cooked it on the stove. And I've cooked it in the Kitchenaid Precise Heat Bowl , which is very precise and won't overcook the mixture. Do it any way you're comfortable - the key is to heat it slowly and never let it get so hot that the eggs begin to scramble, because that's just ugly. Combine the cream, sugar, egg yolks, and salt in your preferred cooking vessel. Heat slowly, stirring continuously, until it thickens and reaches a temperature of 170-175 degrees. Strain the mixture though a fine-mesh sieve into a bowl. Add the milk and vanilla to the bowl and stir well. To speed cooling you can set this bowl in a larger bowl filled with ice water and stir until it has cooled down. Cover and refrigerate until well chilled. Churn in your ice cream maker according to the manufacturer's instructions. When frozen, transfer to a storage container and freeze until firm. 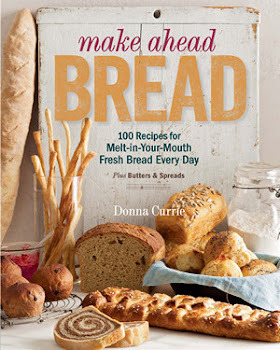 I received the cookbook from the publisher at no cost to me.